The children's hospital Zurich, Switzerland supports a hospital in Jerewan, Armenia to ensure ear medical care. Since 2010, Hear the World supports this partnership with funding, technology and expertise. Weakened by the devastating earthquake in 1988, the remains of Armenia’s economy was torn to pieces after the collapse of the Soviet Union. This small, landlocked nation in the Caucasus has around three million inhabitants, while a further seven million Armenians are scattered across the rest of the world. They today contribute substantially to the economy of their home country. In Armenia, health is a question of means: the state spends a mere two percent of its gross national product on providing healthcare services, which means that the costs of healthcare are virtually unaffordable for many Armenians. On top of this, many hospitals lack the necessary infrastructure and the training given to staff is inadequate, especially in rural areas. The earthquake in 1988 marked the start of a close partnership between the University Children’s Hospital in Zurich, Switzerland, and the Arabkir Hospital in the Armenian capital Yerevan. The Arabkir Hospital is Armenia’s foremost clinic for children and sets the standard for pediatric care across the whole country. The partnership between the two hospitals covers the full range of medical disciplines, with physicians from Zurich traveling to Yerevan several times a year to provide their expertise on site. Since 2010, the Hear the World Foundation has been supporting this partnership by providing hearing aids and batteries, wireless microphone systems for schools, funding and professional support. Hearing screenings for newborns were introduced in maternity clinics in Yerevan in 1997. Thanks to the financial support from Hear the World, this program has since been extended to a further five Armenian provinces. Most of children detected in the program are affected by sensorineural hearing loss which can be triggered by genetic dispositions, but often still the cause remains unknown. If a baby‘s screening turns out to be aberrant, further examinations are carried out at the Arabkir Hospital and if necessary the baby is fitted with hearing aids. School-age children are also equipped with wireless microphone systems, which enable children with hearing loss to attend regular schools. “Thanks to the partnership with Hear the World, we are now able to give children with hearing loss a much better service. With our five local centers, children can now receive audiological care near to their homes, sparing them the long travel to the capital. 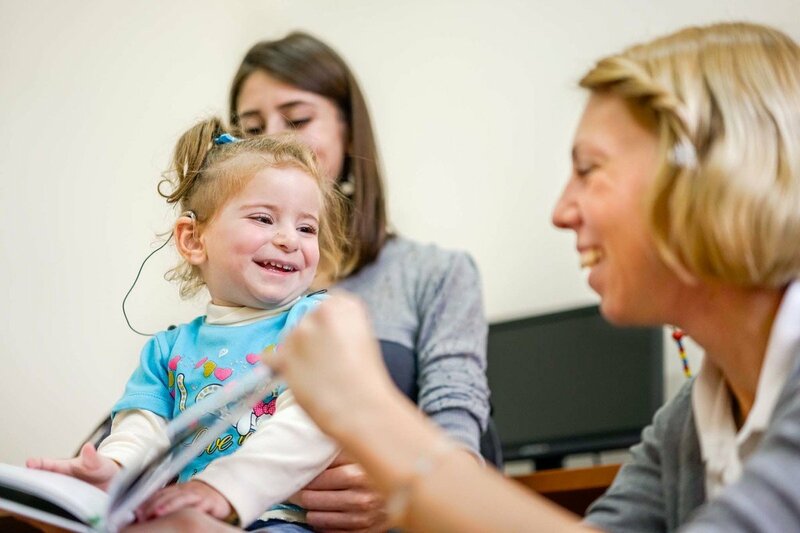 Furthermore, the Super Power hearing aids we now have allow children with profound hearing loss to develop speech at a very young age and thus for them to develop at an age-appropriate rate”, explains Tamara Manoukian, leading audiologist at the Arabkir Hospital. Tamara leads a team of five audiologists, all of whom are extremely committed and passionate to carry out their day-to-day work “The team is very ambitious and eager to learn. Within the last few years, for example, through work-shadowing schemes in Zurich and training programs in Yerevan, we have been able to introduce techniques such as objective audiometry (BERA) for diagnosing hearing loss of infants and young children, as well as behavioral audiometry and modern methods for fitting digital hearing aids.” explains Dr. Dorothe Veraguth, leading physician in audiology at the University Hospital Zurich and project leader of the clinic partnership. Proper training to fit hearing aids is also essential, especially since the technology used is constantly being developed and enhanced. That is why the Hear the World Foundation regularly sends Sonova volunteers to Armenia to actively support the staff working on site with their expert knowledge. This year, the Hear the World Foundation rewarded Tamara Manoukian, Dorothe Veraguth and their team with the John Bamford Award in honor of their outstanding commitment: “The award is in recognition of the efforts of a young committed multidisciplinary team with excellent leadership delivering services to hearing impaired children and families in the face of a number of significant challenges. They are open for support and are committed to ongoing improvement said Professor Bamford, explaining his choice. Prof John Bamford was a member of the Hear the World Foundation Advisory Board and the Head of the Audiology Department at the University of Manchester in 2007. He retains a strong interest in childhood screening, paediatric audiology, and service development and improvement. He chaired a review of audiology services for the Irish Health Service Executive, and was advising on the implementation of a new Audiology Clinical Care Programme in Ireland. The Arabkir hospital offers music therapy classes twice a week. These classes help children sensitize their hearing after being fitted with hearing aids. Thanks to the support of Sonova employees we were able to donate a new piano for the music lessons. Armenia is a small landlocked country in the Caucasus with around three million inhabitants. 90% of the population confess to the Armenian Apostolic Church, which plays a central role for the national identity. Speech therapy is essential for small children to develop at an age-appropriate rate. Visual Reinforcement Audiometry (VRA) is a technique which is used for testing children between the age of 6 months and 2 years of age. During the test, sound is transmitted via headphones or load speakers. Hear the World Volunteer Christiane places an ICube around the neck of little Hasmik. The device enables wireless transmission of data from the computer to the hearing aid. Both Hear the World Volunteers Nazan and Christiane give their very best to keep Ashot in a good mood while his hearing aids are being fitted. There is earwax blocking little Ashot’s auditory channel – the wax must be removed before his hearing instruments can be fitted. The hearing ability of three-year-old children is tested in a playful way with behavioral hearing tests. The Arabkir Hospital is the foremost children's clinic in Armenia and a state of the art clinic for paediatrics in the country. At the ceremonial presentation of the John Bamford Award, children made a wonderful music and dance performance for us. The John Bamford Award was presented to Dorothe Veraguth, Tamara Manoukian and their team in honor of their outstanding commitment. Hearing screenings for newborns were introduced in maternity clinics in Yerevan in 1997 and later, with financial support from Hear the World, extended to a further five Armenian provinces.